Home-made jam might sound threatening, but its really more the result of a diligent process than difficult to make. I want to spread home-made jam message, so to speak, that its easy enough to make but bountifully more impressive of a result! Like this jam - strawberry and rose with chia seeds. Easy to make with just a handful of ingredients. Assuming that you may not actually have the time to go and dry your own rose petals... you can often buy them in bulk from the local health food store. Rose adds an elegant and subtle flavoring to the strawberries. Plus can be used in an abundance of other recipes, so is nice to have on hand. Depending on your use for the jam, or what state of emergency your snack attack is in, it's easy to either prep your cans for a longer shelf life or be ready to eat out of within the hour. Canned jam can be stored for months, if not years! This is a nice read that goes more in depth on shelf life rules and tips. But I couldn't resist, and had to try my jam right away on my Raspberry Maple Walnut bars. I also like to give these little jars of goodness as gifts to friends and family. I simply cut out paper labels, write the jam name, and tied them to the jar with a bow. Perf idea for all the lovely mamas we'll be celebratin (eryday, but commercially) in a few weeks for Mother's day! 1. Remove yr cat from the counter top. 2. 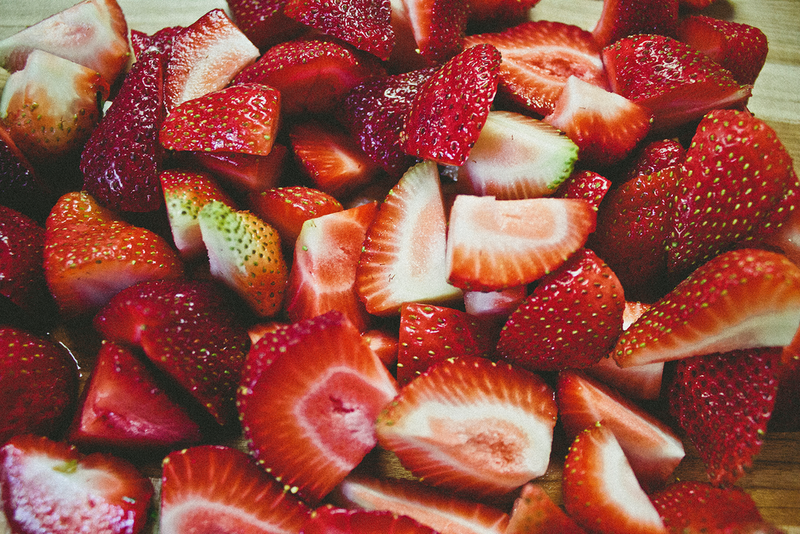 In a large saucepan, heat the strawberries, sugar, rose petals and rose water on medium heat. The strawberries will begin to soften and gently bubble. 3. Add your chia seeds. 4. Allow the strawberries to simmer for roughly 15 minutes, stirring occasionally, until the sugar has dissolved and the strawberries have cooked down to a gooey, thick consistency. 5. Turn off the heat, and pour the hot jam into a sterilized jam jar, filling up to the top. This is a quick jam that I will probably go through in one week so no need for canning. 6. Screw on the jar lids tightly and set aside the jars to cool (you might need to hold them with a dish towel as they might still be hot to touch). As the jam cools, you will hear the lids pop inward indicating that the jam has been officially sterilized! The canning process is complete!